This delicious gammon steak is served with potato roasties and buttered cabbage. 1. Place the gammon in a large saucepan. Cover with cold water and add the bay leaf, rosemary and the onion studded with cloves. Bring to the boil, then reduce the heat and simmer for about 2 hours 15 minutes (or cook for 30 minutes per 500g). Lift the cooked gammon from the liquid and place on a rack to cool for a few minutes. 2. Preheat the oven to 200°C/gas mark 6. 3. Place the potato pieces in a bowl and toss with the oil, five-spice powder and a pinch of salt and pepper. Transfer to a baking tray and roast in the oven for 25 to 30 minutes. 4. Melt the butter in a sauté pan set over a medium heat. Add the shallots and garlic and cook for 30 seconds, then add the red cabbage, wine, honey, cinnamon and a pinch of salt and pepper. Cover the pan and cook for 5 to 7 minutes, until the cabbage has just softened but still has a bit of crunch. 5. Just before serving, slice the gammon into 4 to 6 steaks. Heat a griddle pan over a medium heat, then add the steaks. Sear for 4 to 5 minutes on each side. 6. 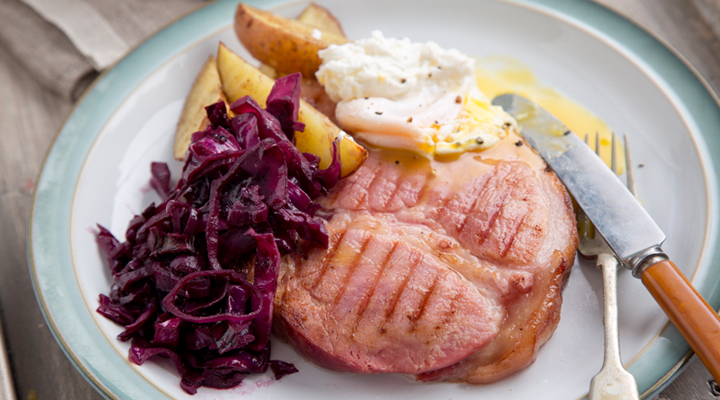 Serve the grilled gammon steaks with the potato roasties and buttered red cabbage.